For 36 years, art has been both work and hobby for owner Elisabeth Godøy. It is a passion that flourished while working for two art book publishers in Oslo and, Godøy has, over the years, built up an extensive network of Norwegian contemporary artists. Now she is a dedicated art dealer and showcases their work at her own gallery. “Quality and variety are important to me when it comes to choosing art. Because of that, I have both old and new artwork from famous, but also lesser known artists on the walls,” says Godøy. She explains that visiting the artists’ studios and learning more about their work helps her to maintain a great relationship with them. The fruit of this dedication and knowledge can be seen not only in her impressive art collection but also in the relationship she has with her clients. Originally from Tysnes, Godøy took the opportunity to dedicate the family-run former grocery store to art when it closed. Gallery Elisabeth G had its first summer exhibition in 1999, which was a great success within the local community. “It all started with a bang. The art in the gallery on the opening night was so popular that I had to travel back to Oslo the next day to stock up the collection,” Godøy says proudly. For the first few years, only a small part of the building was used, but as the gallery’s popularity has grown, so too has the space. 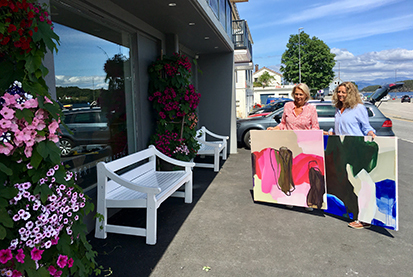 Today, the gallery is about 250 square metres and every summer is full of artistic treasures discovered by Godøy. gallery will be open for visitors until 19 August.